Bayani Fernando implemented great and innovative ideas as the chairman of the MMDA. The famous of his many ideas is the MMDA pink fence. In his stay as Metro Manila Development Authority (MMDA) Chairman, presidential aspirant Bayani Fernando built many pink fences throughout Metro Manila. There are pink fences on the sidewalks, on the streets, on the islands and in any place within the Metro imaginable. 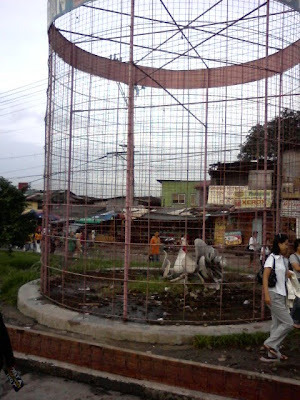 Aside from the usual use of fences, that is to serve as boundary between two areas, Bayani Fernando thought of many ways to use it. 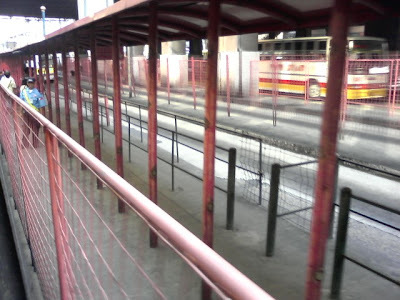 In Cubao and other areas, his pink fences serves as a tool to herd commuters and public buses like cattle. It also serves as a blockade to the pesky jaywalkers all throughout the Metro. The fences also serve as blockades during rallies. It was even used by MMDA as public bulletin boards where MMDA can notify the public of the latest concerts of their chairman. My proposed pink fence jail. This will discipline the Filipino drivers. Instead of just issuing tickets, all the MMDA officers and traffic enforcers have to do is to lock – up each traffic violator for thirty minutes for each violation. Motorists, commuters, and pedestrians can be imprisoned inside the pink fence. If a jeepney driver unloads/loads passengers at “no loading/unloading” area then he can be imprisoned for thirty minutes inside the fence. Jaywalkers will also be imprisoned for thirty minutes inside the fence. Imagine the inconvenience of the time lost for traffic violators and also the shame of being imprisoned publicly. This scheme will deter traffic violators and make traffic more bearable. I know that this is still impossible to implement in the current settings. However, if Bayani became the president, I believe that this is possible since he will rule with an iron hand. it's like treating people like animals. maybe a new idea. ?